We’d love your help. Let us know what’s wrong with this preview of Voices by David Elliott. Told through medieval poetic forms and in the voices of the people and objects in Joan of Arc’s life, (including her family and even the trees, clothes, cows, and candles of her childhood). Along the way it explore Author David Elliott explores how Joan of Arc changed the course of history and remains a figure of fascination centuries after her extraordinary life and death. To ask other readers questions about Voices, please sign up. Is the cover of this book by Charlie Bowater? Mara Yes! Confirmed by dust jacket. This was really fascinating! To be honest, I don't know too much about Joan of Arc, but it was neat learning more about her through this poetry format. I loved the unique perspective of her story being told through things like her armor, her sword, a tower, fire.. the list goes on and on. I did feel like sometimes the flow of the story felt a bit off, but for the most part I liked this quite a bit! This is a creative book, a story told in different types of verse by Joan herself and by different people and objects that were present during her life and near her death (the flames at her pyre, St. Michael the Archangel, her banner, her sword, etc.). Its unique form and its attempt to deal with subject matter like medieval gender roles will likely make it popular with educators, librarians, and award committees. Other Goodreads reviews also suggest that readers unfamiliar with Joan of Arc lik This is a creative book, a story told in different types of verse by Joan herself and by different people and objects that were present during her life and near her death (the flames at her pyre, St. Michael the Archangel, her banner, her sword, etc.). Its unique form and its attempt to deal with subject matter like medieval gender roles will likely make it popular with educators, librarians, and award committees. Other Goodreads reviews also suggest that readers unfamiliar with Joan of Arc liked the book as a general introduction to her life. However, as someone familiar with Joan and who studied medieval literature in graduate school, I was largely unimpressed. The book attempts to grapple with important questions of power, gender, and religion but ultimately misses any nuance and, frankly, seems completely unaware of what actual medievalists have to say about the subject. First, I think the book doesn't take Joan's religion seriously, which is a problem I have in general when authors tackle religious figures and try to write them for a popular, secular audience. Elliott doesn't seem comfortable suggesting that Joan believes her own visions or that anyone else believes her. He has a whole poem from St. Michael's point of view that suggests he may or may not be real and ponders whether, if he is real, he can really be counted as a saint. (Which seems to overlook the Catholic definition that a saint is anyone in heaven so, yes, if Michael the Archangel is real he is 100% a saint; this has nothing to do with whether he feels his personality or actions deserve the title.) Another poem from St. Margaret reflects that "saints are just human" and she can't really do anything to help Joan, which also seems counter to actual Catholic teaching. The book obviously doesn't need to support Catholicism, but I do think a book that is about a Catholic saint and seems to be trying to celebrate that person should, in fact, take their religion and religious beliefs seriously instead of trying to minimize them. I also have concerns about the discussion of gender. Elliott's portrayal of Joan is one (a stereotypical YA one?) of a young girl who never liked doing girly things like sewing, who hated wearing dresses, who always dreamed of going to war, and who says she is more comfortable in the military than anywhere else. There is no historical evidence to support this. Of course Joan and her supporters would have reason to lie and make her seem content with "women's work," but all the evidence we have suggests that Joan was a "good girl," a quiet religious girl who was good at sewing and such and never gave anyone the impression she was itching to throw away her mending, rip off her dress, and go to war. Elliott further suggests that Joan was uncomfortable wearing women's clothes and feeling men's clothes felt "right" to her. Perhaps, but this is speculation on Elliott's part, a suggestion that perhaps she really did feel like or yearn to be a man. Historical evidence, on the other hand, suggests that she dressed as a man primarily to avoid being raped. She didn't want to obviously look like a woman when surrounded by men. Furthermore, historical evidence shows she had a number of fastenings and ties added to her clothing that would have been unusual on the average menswear--presumably to make it harder for someone to forcibly take it off her. The records are also clear that she regularly slept fully clothed AND fully armed; again, presumably for her personal safety. Elliott glosses over all of this. Finally, the book suggests that Joan was primarily killed for acting/dressing like a man. Certainly this was a sticking point in her trial, part of the evidence that she was unnatural, possibly a witch. However, it's clear that she was killed by the English because, well, she was French and winning battles for the French. Again, Elliott completely overlooks an important medieval discussion: the fine line between being a saint and a witch for women in the Middle Ages. Joans actions were praised by the French and condemned by the English; the French thought she was from God, and the English thought she was the devil. This was obviously for political reasons, and she was not killed for acting like a man. I think if Elliott had even really dipped his toes into medieval scholarship or discussions surrounding Joan, the witch/saint dichotomy would have been evident to him, and it should have played a larger role in this book. I read this in the span of 45 minutes, and while the writing was so beautiful, I really didn’t care much for this at all. I don’t think it was as awe inspiring as I hoped, and I really struggled because it wasn’t holding my attention well. Perhaps it’s a case of its-not-you-it’s me, but I just felt this wasn’t exactly my cup of tea. Wow! A historical novel about Joan of Arc in verse? It's either a crazy idea or utterly inspired---turns out it's the latter. First off, I highly recommend that you read this book aloud because a lot of the book is written in rhymed and metered verse. I started out reading in my head, and I liked it, but when I started to read aloud the verse truly came alive. You'll have to have an open mind when you read this---some of the poems are told from the perspectives of actual objects in Joan's life, including swords, her dress, etc. (in concrete poems, so they're shaped like the objects). And Elliott often uses forms of poetry that were popular in medieval times, such as villanelles and sestinas. I loved these unique styles, but I love poetry in most of its forms, so...The book recounts Joan of Arc's last days and the events that led to her trial. Basically, in case you're not familiar with the story, it comes down to the fact that she's a woman who acts and dresses like a man. Horror of horrors! (Oh, and the men she led didn't try to take advantage of her, so she was obviously a witch.) We also get the perspectives of some of the other people who knew Joan. Even though the story is obviously tragic, the emotion isn't particularly palpable (this is often the case for me with verse). Still, I thought this account was engrossing and beautifully told. I easily zipped through the book in one sitting. Other than that — and the general wariness that all brings — the poetic structure was really cool. Much cooler if you read it out loud and get a feel for the rhythms. A little boring and repetitive if you read it in your head. I liked the perspectives of inanimate objects, and the placement of words on the pages. They made designs. I greatly appreciated the actual quotes from the Trials, so that there was some element of truth to be held on to. Now I just have to go read the whole actual trials to gather the real story. Context shouldn’t be malleable, yet we try. This book is exquisite. 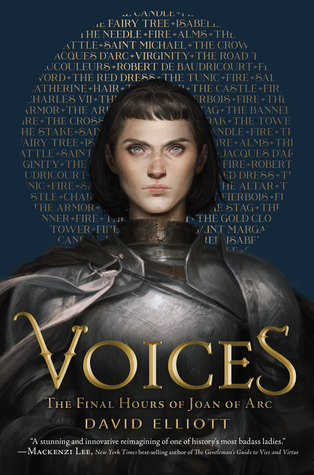 ‘Voices: The Final Hours Of Joan Of Arc’ has brought life once again to one of the most unforgettable and extraordinary female warrior icons. Everyone knows her name, but do they know her story? Told in verse, in different medieval forms of poems, ’Voices’ is so unique (some stanzas are shaped like the subject that is ‘speaking,’ ie the sword or the crossbow). David Elliott has written such a compelling account of Joan’s short life from her beginnings in Domrémy, to her v This book is exquisite. ‘Voices: The Final Hours Of Joan Of Arc’ has brought life once again to one of the most unforgettable and extraordinary female warrior icons. Everyone knows her name, but do they know her story? Told in verse, in different medieval forms of poems, ’Voices’ is so unique (some stanzas are shaped like the subject that is ‘speaking,’ ie the sword or the crossbow). David Elliott has written such a compelling account of Joan’s short life from her beginnings in Domrémy, to her visions of the Saints, the battles she led against the English, and her eventual capture and execution. The encroaching ‘Fire’ poem that repeats throughout the novel is particularly clever and impactful. Back then in 1430 France (when she was captured and put on trial), Joan was viewed with suspicion and as an affront to the Crown because she dressed in armor and wanted to ’look like a man’. She didn't believe she should have to stay at home ’to sew and mate’ when a war was being fought, simply because she didn't want to, never mind her sexuality. Her story has always been known as one of the earliest examples of a woman standing up against misogyny, against a patriarchal system that didn't make sense to her, and because her beliefs simply wouldn't allow her to sit down and accept what was happening around her. Joan’s voice and perspective come through clearly in the novel as brave and courageous, with the right bit of stubborn. She questions the system and pursues her objectives, which give the novel an obvious ambiance of inspiration throughout. I only really wanted more from the novel when it came to the trial and perhaps the very end of her life. Joan became a Saint after her death and was declared a martyr for everything she gave for ’God and country’. I did appreciate the epilogue and author's note at the end of the book; it seems this work was a labor of love and I enjoyed reading about its inception. 2/19/2019: Second read through for a reading challenge, prompt "historical retelling." This is the perfect quick read to fulfill the prompt too. I think I enjoyed it more this second go around since I knew what to expect. The trouble women face with societal expectations hit me a little harder this time and I can't stop thinking about it. This was a different kind of read for me. It's kinda a historical verse novel with some perspectives that are explored and imagined. Unfortunately, I don't c 2/19/2019: Second read through for a reading challenge, prompt "historical retelling." This is the perfect quick read to fulfill the prompt too. I think I enjoyed it more this second go around since I knew what to expect. The trouble women face with societal expectations hit me a little harder this time and I can't stop thinking about it. This was a different kind of read for me. It's kinda a historical verse novel with some perspectives that are explored and imagined. Unfortunately, I don't connect well with verse novels well, but this was pretty good for something I don't normally connect with. It is creative, it is strong, and it does a good job painting what it is like to be a woman in a very man-centric world. Not to mention, some of the perspectives from inanimate objects were really neat and explored how things on or around a person can influence how they are perceived, especially when it comes to people who present a threat. I suggest that you give it a shot and see how you like it--it was a surprise to me, seeing as I anticipated not digging it much. Okay, so something to know about me is I have a weird fascination with Joan of Arc. Literally one day I woke up and had to know everything about her. So when I heard there was a YA book about Joan of Arc coming out I knew I had to get my hands on it. I also had some really high expectations. And I can say, without a doubt, this book was everything I wanted and more. I didn't expect the book to be told in poems (I obviously didn't read the synopsis), and it ended up being a delightful surprise. Wha Okay, so something to know about me is I have a weird fascination with Joan of Arc. What fascinated me most about this collection was the little details. Like the fact that each poem is written in a poetic style popular in Joan's lifetime, how some poems are shaped like the object it's POV is told from, including quotes from Joan's trial, and how the poems aren't just written from the point of view of Joan and company, but from the objects close to her as well. I didn't expect half of these things when I started reading, and now I couldn't imagine the story being told well without them! and not without a share of grief. I lived like a hero at seventeen. At nineteen, I die like a thief. This was my first time ever diving into a book written in verse, and I was NOT LET DOWN. Jeannette- more commonly known as Joan of Arc- was my biggest idol during my childhood years. I aspired to be her, I read tons of kid friendly history books about her, I wrote all my essays about her in some way or form, etc. She was a big part of forming who I am today. So trust me when I say that I'm pretty damn knowledgable about her. That being said, this book did a spectacular job in summarizing the formative and, consequentially, the end years of Joan's life. While there are definitely some parts glossed over or ignored entirely (come on, this book would have to be WAY longer), David Elliott does a good job in playing with different poetic forms and words to put a unique voice to her story. He not only uses multiple forms- nine, to be precise- he also uses multiple perspectives of both animate and inanimate objects to shine a new light on the true tale of Joan of Arc. He swaps between Joan's POV to the cattle in the fields, the red dress she wore every single day to the suit of armor and the sword she donned, the Saint Michael to the banner Joan flew under. would dare to fight the angels singing there above her head? Just, like, does anyone have any recommendations similar to this? Where the author brilliantly uses the key objects that defined a person to actually describe said person? Even her warhorse has some words to share! when we were the wind, untamed, unafraid. by my spirit, left broke, unseated, unmade. And not only does he incorporate all these incredible poems from different perspectives, but Elliott also throws in direct quotes from the Trial of Condemnation AND the Trial of Nullification! I enjoyed this more than I expected. The poetry made more sense to me as it had a story to tell, and it is based on Medieval types of poetry which apparently match some types of poetry in Spanish (I don't understand poetry in English all the time). And of course, my child heart that used to play Age of Empires II, knew how to pronounce all the places and surprisingly to myself, a lot of the story and characters. It felt like coming to a meeting fo The fire poems are in some way my favourite but I enjoyed this more than I expected. The poetry made more sense to me as it had a story to tell, and it is based on Medieval types of poetry which apparently match some types of poetry in Spanish (I don't understand poetry in English all the time). J Godwin Thanks! I’ve always wanted to read about her. Only saw the movie with Milla Jojovich which was awesome as well. Madison Berry This book is incredible. The author is definitely very knowledgeable about Medieval history and Joan’s life....you should totally try this! This would be a fantastic book to use in a book club or book study. The history, the queer lens component (would Joan today be trans or just a normal soldier who happens to be a woman, how does our time and culture influence identity, etc), and the poetry involved. So much learning could be done with this book, amazing. That was a very cool reading experience--the verse, the metre, the shapes and formatting--and I'm rounding up my initial 4 star reaction because the more I think about it, the more I like. Also, I am not a poet, much less capable of writing in any kind of meter and this was so impressive. There's just SO MUCH HERE. I'm glad to have another badass historical heroine to put in front of reluctant readers. I think this book is easier to slid into than BLOOD WATER PAINT, and might have a stronger appe That was a very cool reading experience--the verse, the metre, the shapes and formatting--and I'm rounding up my initial 4 star reaction because the more I think about it, the more I like. Also, I am not a poet, much less capable of writing in any kind of meter and this was so impressive. There's just SO MUCH HERE. This is a book told in verse – specifically through mostly medieval poetry forms – and gives voice to Joan of Arc, as well as the people and objects involved in her life. The shifting perspectives alternate with Joan’s own telling of her life as she awaits her execution in her final hours, filling out a story that, while well-known, is not humanized. Joan was a real girl, people were truly affected by her, and those who loved her lost her to history. These poems take the reader through Joan of Arc’s childhood when she began to feel the chafe of a girl’s lot in life while growing up in 15th century in rural France, to her adolescence when she began to hear the voices of the Catholic Saints. We follow Joan through battle and her trials, the author includes actual transcript material from both her Trial of Condemnation that led to her execution, and her Trial of Nullification which absolved her after her death. This book was absolutely breathtaking. I do not seek out experimental fiction, nor do I lean towards poetry; but I could not put this book down, and I filled it with post-it notes so that I could return to my favorite passages in the future. Joan of Arc is a fascinating and divisive character in the history of western civilization – was she a mentally ill teenager or a young woman touched by the divine? This book does not seek to solve this puzzle, but to give Joan a voice and to show through a multitude of perspectives what it was to know her. I was taken in from the first poem, told from the perspective of fire which would later kill her, when a candle describes its attraction to the spark that is seen within Joan. I am sure that I will continue to be moved by this book. I really, really wanted to like this book. History, especially women’s history, is my thing. It’s what I study, and historical fiction as a genre helped cultivate my passion for history. But this book doesn’t really fit any of these genres, which might b ARC provided by the publisher via Edelweiss in exchange for an honest review. I really, really wanted to like this book. History, especially women’s history, is my thing. It’s what I study, and historical fiction as a genre helped cultivate my passion for history. But this book doesn’t really fit any of these genres, which might be the reason I didn’t enjoy this. It’s a mishmash of poetry, historical fiction, history, and maybe some other things. The concept was so interesting, and Joan of Arc is such an interesting character historically, both for the gender nonconforming aspect of her person and for what she achieved as a woman in such a patriarchal society. Basically, I think this book was supposed to be (and the author explains at the beginning and at the end) a reanimation of the last year or so of Joan’s life. The author draws on testimonies from her two trials, the first her trial of condemnation and the second her trial of nullification (post-mortem). He then takes great liberties to try to frame her words and make her into a real person using poetry from a multitude of perspectives, including her own but also those of inanimate objects and relevant individuals. This, however, is where the innovation ended. The book is non-narrative, which I knew going in, but I expected something a little more well-thought-out. The poetry itself seemed repetitive and uninspired, and very, very forced. I understand what the author was trying to do here, but it did not work for me. The poetry was very literal, which is something I do not enjoy at all. Much of what I read seemed to me better suited for lyrical prose than verse, despite the fact that there was little narrative element to it. Other than that, I found the shaped poetry formats rather difficult to read. I felt that those perspectives didn’t add much at all. Yeah, so overall, I didn’t like this. Great concept, poor execution. That being said, just because I didn’t like it doesn’t mean you won’t. While I think it is novel to tell the story of Joan of Arc in a verse novel, I feel like this one tried way too hard. The vocabulary was very high and lofty, which is not the best choice for a teen book. Likewise, I felt the point of view changed far too frequently and that the only truly interesting voices were Joan and the actual quotes from the trial. I don't think is recommend this. As someone who has also worked creatively with Saint Joan of Arc's Trials, I thoroughly enjoyed this book. Those who are not as familiar with the story or source material can appreciate the detail and emotion put into the poetry. I loved how Elliott played with form and shape, but the ebook edition made some of the poems difficult to read. The reoccurring fire's voice was haunting. I thoroughly enjoyed this book. I loved the use of different poetic forms for each of the voices, and the fact that the different poetic forms were all used in Joan's time made it more special. Not only was the voicing great, but the story was told in a way that even people not familiar with Joan of Arc's story will still enjoy it. No prior knowledge necessary. As it is a short book told in verse, this is a very quick read. This is a bunch of records from Joan of Arc's trial, and then poems based on those records, from the standpoint of people involved, interested objects, and abstract qualities. You can, and should, read it all in one sitting, like it was one long poem. At one point a Saint says that Joan should have "faith in the fire" in a pretty sinister way. Uff, que libro más raruncio y más poco aprovechado. No solo en cuanto a trama, que no hay a penas trama ni nada a resaltar, los personajes (por llamarlos de alguna manera) tan mal tratados a penas tienen hueco en la historia. Tengo que decir que no soy muy fan de las novelas en verso pero esta no tenía ni pies ni cabeza. Certainly not a normal choice for me, I find this novel in verse to have piqued my interest again in the story of Joan of Arc. I am glad to have received an Advanced Reader Copy of this title at ALA Midwinter, to allow me to read it this weekend. I loved how the voices of Joan, and the other people of her story, are shared to paint a picture of her final hours. I've always been fascinated by Joan of Arc. I remember doing a big project on her when I was in school, and eagerly reading the translations of her trial. So when I saw this book was out, I jumped on it. I think it was well done, the poetry styles really work. Totally recommended. I was transfixed by Elliott's use of language as he told the story of Joan of Arc. Poetry enthusiasts (which I am generally not) will appreciate the poetic forms listed in the author's note. It is a pleasure to see masterful work. That is how I felt as I read this in one sitting. Me ha gustado y me ha parecido curioso. Al estar en verso recomiendo escuchar el audiolibro, la rima es más limpia al escucharla por un narrador experimentado que al leerla. Me ha dejado con ganas de leer más obras del autor del estilo. Wow! What an unusual kind of storytelling. Couldn’t stop reading. My initial hesitation with a male author writing Joan’s story was completely flipped by the creativity and passion shown in its telling. Highly recommend for fans of Hamilton, or lovers of history and poetry. Sign up me for novel in verse, and this one is so inventive, using formal structure and many POVs to put a fresh spin on an oft-heard tale. Creative poetic forms; minimal concern for historical accuracy or authentic medieval context. David Elliott is the author of THE COOL CRAZY CRICKETS and THE TRANSMOGRIFICATION OF ROSCOE WIZZLE. He says of AND HERE'S TO YOU!, "My neighbor’s rooster and I were having a disagreement. I wanted to sleep in the morning; he wanted to crow. The rooster won, of course. The first verse of AND HERE'S TO YOU! is a tribute to his victory and to the joys found in simply following your nature."